"Refreshingly radiant, the second release by the piano trio known as Tri-Fi is a hopeful session of original music... Their 2005 self-titled debut offered a glimpse at their interplay, but Postcards delivers an assured message with brilliant swing." Refreshingly radiant, the second release by the piano trio known as Tri-Fi is a hopeful session of original music. 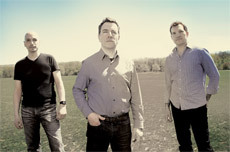 The trio of pianist Matthew Fries, drummer Keith Hall and bassist Phil Palombi was originally formed as the rhythm section for vocalist Curtis Stigers, but they have gone on to tour and record together as a working unit. Their 2005 self-titled debut offered a glimpse at their interplay, but Postcards delivers an assured message with brilliant swing. The disc opens with Fries’ ringing “The Pumpkin, informed by an infectious bop theme that certainly draws one into the trio’s swinging karma. By the time Palombi takes his solo, the tune is strangely familiar, anticipating the rush the trio provides. Likewise, the bassist’s “Copenhagen runs the up-tempo energy groove with a well-groomed cadence that announces Tri-Fi is practiced and adept at dexterous playing. For certain, these three have more to offer. The lovely ballads provide additional space to hear the music. All three are featured nicely on “Hatteras Reflection, with a blues articulation. Guest saxophonist Steve Wilson sits in on “Orchid, playing a patient response to this most reflective track. Wilson can be heard on two other tracks, the ever-changing “Wisdom…1st Things 1st and the Horace Silver-inspired closer, “The Heathrow Shuffle. The sparkling shuffle ventures into a favorite soul-jazz groove that is a crowd pleaser. As a piano trio, these musicians have certainly been influenced by the aforementioned Silver, but also Bill Evans, Kenny Barron, Mulgrew Miller, and Cedar Walton; and that’s not bad company.